6 Classes, 5 Hours, 4,000 Calories burned! RPM (Spin) – First class of the day for everyone at the event, and it showed as the room was only about 20% full so a lot of empty bikes. In terms of the music, I have to be honest that I was not too keen on the first half, but the last few tracks were great and made up for it somewhat. Body Attack – Normally one of my favourites, but so busy it was difficult to move at times (must have been 1000 people there). The sound system was also terrible in the room used so I could not actually tell what half the tracks were, but it was still fun to have that many people involved, and I am looking forward to trying this out back at my gym soon. Body Combat – Pretty much see above, although at least there was a but more room in this one (useful when you are kicking at head height!). The tracks seemed a bit better, and to be fair this is in part all about watching the lead instructors on stage who seemed to defy gravity with their amazing martial arts technique. Sprint – My second bike based class of the day. This one is a more intense version, with a 45 minute class squeezed into 30 minutes, meaning you work just as hard but in less time, i.e. it is a killer! The class has only been going 6 months so is still new, and I have not been a huge fan so far, but I liked this a lot more, great music and choreography. An unexpected highlight of the day. Sh’Bam – We picked this as a bit of fun after first experiencing it in Manchester. My thoughts are still about the same, in that there are a load of amazing professional dancers on stage with most of the audience dancing around wildly like a drunken wedding crowd. I have no co-ordination to manage this, but who cares when it is so much fun and you are burning calories too! Overall it was a decent day. There were a few technical issues around music volumes / broken microphones / overcrowding, but nothing I do not see every week in regular classes. The Les Mills lead instructors seem to be pretty superhuman, whether demoing ludicrous tuck jumps at nearly head hight, or showing better moves than Beyonce’s backing singers, they are hugely inspiring. Of course, the best part is the general atmosphere, and mixing with thousands of like-minded exercise nuts – Bring on Manchester later this year! Is it weird to write about your own medical report? I don’t think so, as there is nothing really too personal there, at least that I will go into here. This testing is a company requirement, which we undertake every couple of years. I first wrote about this early on in the Chile Challenge (https://chilechallenge.wordpress.com/2014/04/25/whats-up-doc/), so thought it would be interesting to see how things had moved on after two years of fairly intense exercise. The medical involves about 2 hours of various tests and I find it fascinating, having never really spent any time at the doctors before. I did notice there was an enhanced option which included VO2 Max and some other bits which I would have loved to see out of curiosity, but the extra cost was too high for just personal interest. After the visit they send a huge pack of data, covering everything from your blood pressure to risk of diabetes, and the good news is everything is not only acceptable, but also moving in the right direction. I have copied some of the data below, for BMI (which I still think is a huge con!) and Body Fat, and the trends say it all – the exercise does work! In terms of BMI, I did get asked once how I was planning on getting this down, and I think my response (by doing an Ironman in 2 months) pretty much covered it! Another of the findings was around Estimated Average Energy Requirement, which is the amount of calories my body requires, based on both body tests and activity levels. Apparently mine is 2724, which is more than the 2,500 I always assumed, so a bit of a bonus there I guess! A few days later, I noticed a queue of people in the gym around a monitor and could see them checking out some sort of x-rays. It turned out he was a physio with a specialism in spine alignment, and had some sort of fancy portable MRI scanner to check for signs of stress in the upper and lower back. Of course I got mine done, and it came out with the below image. To be fair, I am not too sure what it meant as it was one where you had to go for a follow up appointment (i.e. pay extra) but in short it meant I have some extra stress in my lower back, possibly as I had just recently had a series of long (4 hour +) drives, and also as I had just done a Body Pump class, where 1000+ reps might have impacted my spine a bit. He did say although it looks red above, it is not the worst it can be, with some people getting a stress score in the thousands which need urgent attention. Still, always interesting to see something like this, and maybe I will test it again in future and it if gets worse I can follow it up further. Anyway, that is all for today. I am off to do some training in sunny Cuba… although I have already written about that too! After the success of my first ever buddy run in Cornwall over the summer, I thought I would try to repeat the trick last weekend. Naturally I decided I had to step things up a notch, and what better way to do so than running with my lovely wife! Now in the not too distant past this would never have been an option to either of us: me as I tended to prefer do my triathlon training alone and had yet to experience the motivational benefits of having someone to run alongside; and my other half as basically she hated running! That is not to say she could not run, having done Race For Life a few years earlier and plenty of fitness from going to the gym 4 or 5 times per week, but in general she has always been more into group exercise classes or the odd bit of cross training than cranking out the miles on foot. But during the summer – in a manner I am all too familiar with – she experienced a moment of madness and managed to convince a group of us to sign up for an obstacle race in the autumn (more on this to follow soon). This was a 5 km distance involving various hazards and obstacles, so she decided it would probably be a good idea to get a few miles under the belt before hand: As I have said many times before, nothing like entering a race to add a bit of an incentive to training! 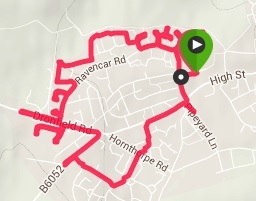 We decided to do an early morning run on one of my regular routes near her family’s house in Yorkshire, winding around the streets, up and down cul-de-sacs and generally exploring the area. The rule is basically, keep to the side and every time you come to a turning you have to take it, and as you can see from the GPS tracker below we covered most of the perimeter of the estate over a 6 km distance. I had been nervous before that she would hate it, but actually it went down really well. I was really impressed with the fact we kept going with no stopping, and it was a great confidence booster ahead of the obstacle race. Next stop – Ironman for two!?! For most of the Challenge this year I have been focusing on endurance and distance; after all the whole reason it started was for me to be able to build up enough fitness to be able to finish the Avenger earlier this year. But since completing my final race of the season earlier this month I have been adding some variation to my training, with things like Spin and Pump classes. Now I have to say something here: I never minded doing gym classes, but always saw them as something for people who could not manage to train on their own, whether due to lack of motivation or needing to have other around them to keep going. But after the last few weeks I am willing to put my hands up faster than an Apprentice contestant trying to shift the blame for a failed task onto a teammate, and admit I may have been wrong. Whilst the classes I have been doing have been limited to 45 minutes or an hour max, the amount they manage to cram into such a short time really makes it worth it. Rather than long steady paced rides, I have been doing interval and hill based training that I can honestly say I would never have been bothered about doing to the same extent on my own. Yes, you won’t get the same endurance benefits as say a 3 or 4 hour bike ride, but the improvements in my sprinting and speed have been great, and what is great is how quickly I have been able to see the results. As well as the normal tracking I have been doing on each individual session and distances completed year to date, I also built in a PB tracker to my Chile Challenge spreadsheet (just to clarify, some people might call this a PR or Personal Record, but over here we tend to use Personal Best). This focused on the three main triathlon events and my most regular training sessions: a 1 km swim, a 30 km bike ride, and a 10 km run. Of course I am not suggesting I will be entering Record Breakers or anything, but any semi-serious triathlete should to have an idea what sort of times they are pulling off during the season. Now looking at the first of these, I don’t really track my swims in that much detail. This is mainly because I rarely go for an all out swim session, but tend to do it after another training session to warm down or stretch out. I also can’t compare it to my races which are either 1500m or 750m, and finally I never remember to wear my watch or check the clock beforehand. If I had to hazard a guess I would say my 1 km time would be in the region of 18 or 19 minutes (based on my 1500m time), but perhaps at some point I will get around to measuring it. The two I have bothered recording (mainly as they are much easier to track using my various gadgets) are my bike and run times, both of which started the year just on the hour mark. Fortunately these have come down a bit over the year – by a bit but good for me – with my run times hitting 59 minutes in February, and 58 in May. I am currently on 57.52, but the aim is to try and get it down towards 55 mins by the next race season. Today however was bike day. Now on the face of it, this would not have been a great time to try breaking records, having knackered myself with yesterday’s Combat / Pump combo – particularly my glutes from all those squats, which are a major part of bike riding. So this was supposed to be a recovery ride. Except this was my first pure (i.e. non-class based) ride in some time, and I found I was really getting into it. So much so that I hit the 15 km mark in 29 minutes, and realised I still had plenty in the tank – which I could only put down to those crazy interval sprints I have been moaning about over the last few weeks. So rather than slow down in the second half, which I would usually do, I pulled off a great negative split (doing the second half faster than the first) and managed to beat my all time PB by a minute – up from 57.42 in July to 56.47! So having spent this year building up my endurance, here’s to hoping that a winter of interval training will see my speed picking up over the next six months, in time to smash my race PBs next race season. 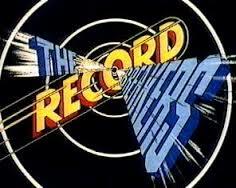 All together now “R-R-R Record Breakers”!